Welcome To Our Home Snapper: Glad You Are Here This item is on sale. FROM STORE OVERSTOCK, NEVER USED...From Bent Creek, this 3rd in the Welcome To Our Home Snapper series is stitched on 30ct Parchment linen using Weeks Dye Works, Crescent Colours, and Gentle Art Sampler Threads. Individual stitch count is 50 x 50. Comes With the snaps used. If stitching the entire series design, the stitch count is 291 x 80. Welcome To Our Home Snapper: Will You Stay Awhile This item is on sale. FROM STORE OVERSTOCK, NEVER USED...From Bent Creek, this 5th and final in the Welcome To Our Home Snapper series is stitched on 30ct Parchment linen using Weeks Dye Works, Crescent Colours, and Gentle Art Sampler Threads. Individual stitch count is 50 x 50. Comes With the snaps used. If stitching the entire series design, the stitch count is 291 x 80. Welcome To The Country This item is on sale. From Graph It Arts, out of print chart is in EXCELLENT condition, appears never used, with no markings of any kind. 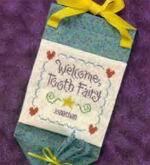 Welcome Tooth Fairy This item is on sale. SHOP OVERSTOCK .. This quick-to-stitch project is sure to please all toothless kids in your family! Designed to be appropriate for both boys and girls, this easy design can also be personalized. Stitched on 28 count Antique Ivory Cashel linen using Gentle Art Sampler Threads and Weeks Dye Works. Stitch count is is 59 x 60. Welcome Tree This item is on sale. FROM STORE OVERSTOCK, NEVER USED...From X's & Oh's, out of print chart is in EXCELLENT condition, with no markings of any kind and price sticker on front cover. Welcomes 'a Plenty This item is on sale. FROM STORE OVERSTOCK, NEVER USED...Chart is in EXCELLENT condition, never used, with no markings of any kind. Western Reserve in the Springtime This item is on sale. FROM STORE OVERSTOCK, NEVER USED, in EXCELLENT condition...From Trenner Needleworks, this design is full of wonderful motifs, specialty stitches and embellishments with a great springtime look. Whaling Ship Sewing Tray and Pinkeep This item is on sale. FROM STORE OVERSTOCK, NEVER USED...From Stacy Nash Primitives, stitched on 35ct Weeks Dye Works Dove Linen using Gentle Arts Chamomile, Cranberry, Carriage Black, (2) Straw Bonnet, Black Licorice, and Tin Bucket. Stitch Count is 134 x 157. Whatever This item is on sale. FROM STORE OVERSTOCK, NEVER USED...From Amy Bruecken Designs, stitched using Weeks Dye Works, DMC floss, and Kreinik #8 Braid on 14ct or 28ct White/Silver fabric. Stitch count is 71 x 54. Finished as a soft pillow on a Hang It Up decorated wire! When - punch This item is on sale. FROM STORE OVERSTOCK, NEVER USED, chart is in EXCELLENT condition...From Hot House Petunia Designs, this punch needle design comes WITH the pre-stamped fabric. Uses the 3-Strand Needle and 8" hoop along with Gentle Art, Crescent Colours and Weeks Dye Works (OR DMC floss) fibers. Also comes WITH the JABCo bird button and orange beads used. Works up to approx. 3" x 4 3/4"
When Love Blooms This item is on sale. From Leisure Arts, leaflet 2023. Out of print chart is in EXCELLENT condition, appears never used, with no markings of any kind and price stickers on front cover. Where's That Bunny? This item is on sale. From Angel Stitchin', published 1997. Out of print chart is in EXCELLENT condition, never used, with no markings of any kind. Whimsical Christmas Snowmen This item is on sale. From Sigrid Designs, out of print chart is in EXCELLENT condition, appears never used, with minimal writing n back cover (does not affect charted design). Whine Less, Breathe More This item is on sale. FROM STORE OVERSTOCK, NEVER USED...From Lizzie Kate, the 2nd of a 4-4-part series of Less=More Double Flips. Inspired by antique alphabets and motifs but reinterpreted with some classic L*K flair, the Less = More theme is present in each of the designs .. that can be stitched alone on 28ct Lambswool Linen or combined into one long sampler using 32ct Lambswool linen with LK's free Border Design. If stitching as one long design, the overall stitch count is 91W x 348H and uses Gentle Art Sampler Threads (Dungarees, 2-Endive & Old Blue Paint) as well as Weeks Dye Works (Dirt road, 2-Madison Rose, 2-Molasses, Pecan, Purple Haze, Romance, 2-Straw & Tarragon). Embellished by tiny golden hearts and iridescent raspberry beads which are included WITH the chart. Whisper Me A Wind This item is on sale. FROM STORE OVERSTOCK, NEVER USED...From Whimsey & Wit, out of print chart is in EXCELLENT condition, with no markings of any kind and price sticker on front cover. White Oak This item is on sale. FROM STORE OVERSTOCK, NEVER USED...From Water's Edge, out of print chart is in EXCELLENT condition, with no markings of any kind and price stickers on protective plastic cover. White Peacocks 2 This item is on sale. Whoooo's There/Owl-o-ween This item is on sale. FROM STORE OVERSTOCK, NEVER USED...From Blackberry Lane, stitched on 30ct Onyx linen using Weeks Dye Works. Stitch count is 74 x 74. The chart pack also includes "Owl-o-ween" (which was previously featured in JCS 2013 Halloween Issue Magazine). Wild Horses This item is on sale. FROM STORE OVERSTOCK, NEVER USED, WITH NO MARKINGS OF ANY KIND...From SamSarah, this unique wedding sampler was stitched on 28 count Tin Roof Gingham Natural linen using Sampler Threads and Weeks Dye Works. Stitch count is 143 x 63. Wild Side This item is on sale. SHOP OVERSTOCK - NEVER OPENED .. From Judy Odell & Just A Thought Needlework comes A "Cross Over Design" that incorporates crayon, heat and needlework; the design is preprinted onto the fabric, you color it and stitch it. Kit includes: Design printed on fabric, fusible interfacing, Color and Stitch guide and finish and framing instruction. Use your favorite colors and left over stash or follow the stitch guide that includes the colors and DMC floss shown for the model. Wild Wonders This item is on sale. From Something in Common, published 1999. FROM STORE OVERSTOCK, chart is in EXCELLENT condition, appears never used, with no markings of any kind and price stickers on front cover. Wildflowers Galore This item is on sale. From Canterbury Designs, out of print chart is in EXCELLENT condition, with minimal writing on front cover. Window Box Pin and Earrings This item is on sale. FROM STORE OVERSTOCK, NEVER USED...out of print chart is in EXCELLENT condition, never used, with no markings of any kind and price sticker on front cover. Windows Of My Heart Fiber Pack This item is on sale. Wine A Bit This item is on sale. From Sue Hillis, introducing "PostStitches" - a new line of smaller stitching design cards for little quick stitching for every occasion! This little design, when stitched on 14ct or 28ct fabric will fit perfectly into a Wood N Needle frame, 5 1/4" x 3 3/4" Used chart does NOT include charm.